I discovered this technique of illustration during my year in Switzerland and Milano, 1959-1960. They had the same repro problems with letterpress and newspaper reproduction. I think it came about after looking and admiring so many ads in the Neue Zürich Zeitung -- the Züri-Zeetig in Schweizerdeutsch, but that's a rough translation of a language I never could figure out. 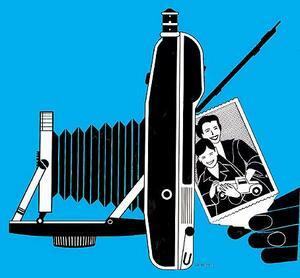 This drawing was used for a silk-screened metal sign. Click on image to enlarge. This is an example of an illustration technique I created to make a prosaic product look a lot stronger than it would as a traditional product photo. It is a pen-and-ink drawing made from measurements taken directly from the camera and stylized to create visual tension between the black solids and the white lines separating these solids. Click on image to enlarge. 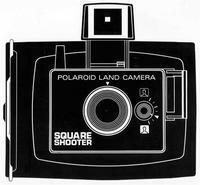 The Square Shooter had a one-piece plastic camera body that was used for all the Polaroid Colorpack line of cameras, with a different face plate added for each mutation. 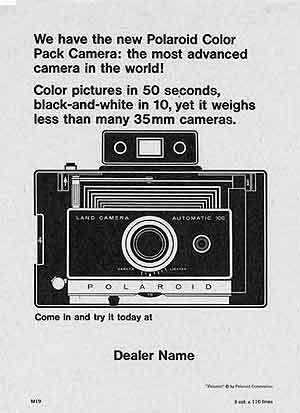 Square Shooter indicated that the camera used square format film that came along later when Polaroid wanted to lower its film prices that are all based on the square inches (or cm.) 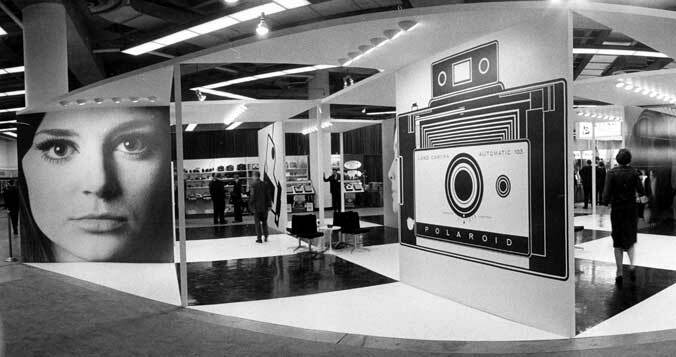 of film used. [More about that development later.] We had the problem that I mentioned earlier of having to print by flexography on inexpensive board used for folding boxes. Click on image to enlarge it.